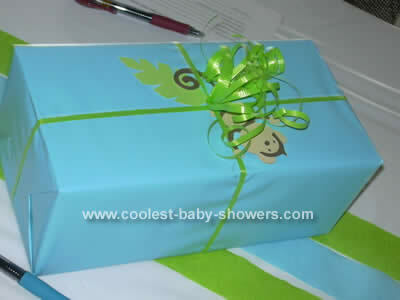 I recently gave a Safari baby shower for my brother and sister-in-law who were expecting a boy. 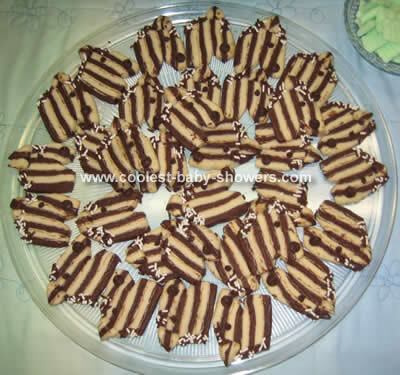 Because the baby’s room was going to be decorated in a Safari theme, the baby shower was also done in a Safari theme. We were also on a bit of a budget so I double-dutied wherever I could. My mother, sister, and sister-in-law’s mother all helped out. 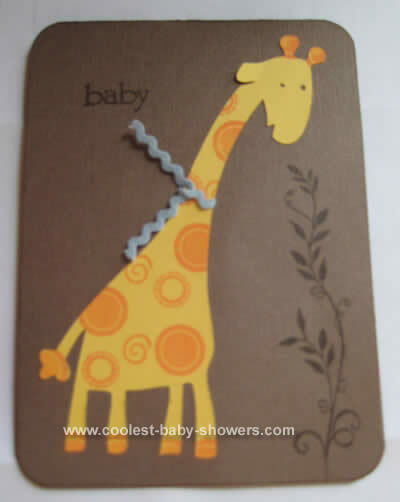 These handmade Safari baby shower invitations were a huge hit! Guests are still talking about them. 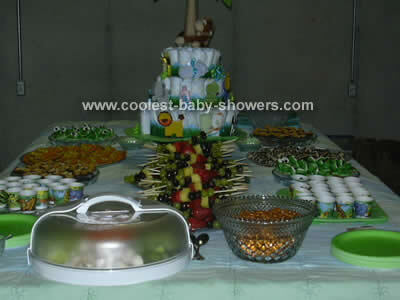 We chose lime green and aqua blue as our main colors to go along with our Safari baby shower. For the tables we simply used white plastic table coverings and then used green and blue crepe paper down the center to pop some color. Our centerpieces doubled as our door prizes. For half the centerpieces we used green and blue balloons. The balloon weights were clear cellophane bags filled with green M&Ms. The other half of the centerpieces were boxes wrapped in blue paper with green ribbon and a cute little paper cut out monkey. Inside the boxes was just some Bath and Body Works stuff. We had some stuffed giraffes and an inflatable palm tree (found at the dollar store) on another table. I also got a zebra bank to match the theme and also doubled as a gift to the baby. For the main centerpiece of the Safari baby shower food table I made a diaper cake (which doubled as my present to the mom). I found already painted Safari animals at Hobby Lobby. I got some “grass” bulletin board border at a teacher supply store. 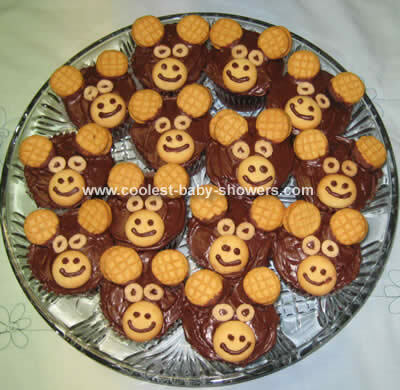 Everything else on the Safari baby shower cake was different types of baby items. Whatever I could find in blue, green or with a Safari animal on it I bought it. 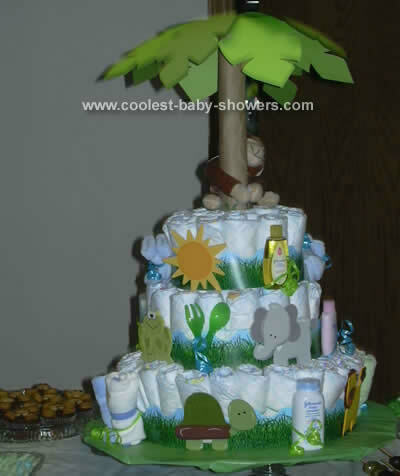 I think I spent about $40 on that Safari baby shower cake. These cards were given to the parents to be. It was fun for them to read through the cards. 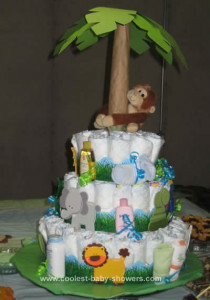 When everyone had finished filling out the cards we started the Safari baby shower. We went around the room and introduced ourselves. When it was each person’s turn they stated who they were and how they knew the mother-to-be. They put their coins in the zebra bank and also got to read off the advice they wrote down on their cards. This was nice because it gave each person a chance to say something to the mom-to-be. We had around 35 people at the Safari baby shower and they were of all ages so I kept the games simple and low key. For the first game our guests had to match the animal baby name with the common name (elephant/calf). There were about nineteen animals so it was a little hard. They had a five minute time limit. The second game was just an unscramble. I had come up with 25 baby-related words or two word phrases and just scrambled the letters. I made both games simply using Microsoft Word. Each guest got one sheet of paper. One game was printed on one side and the other game was on the other side. While our guests were playing the games I counted up the money in the piggy bank. We had each guest write down their guess to the total amount of money given and the closest without going over won a prize. After the Safari baby shower games, we ate and then let the mom-to-be open presents. I had four door prizes left, so I set a timer for five minutes and whoever’s present was being opened when the timer went off won a prize. *Double duty whenever you can it will save you time and money. *Check out the Dollar Store because you never know what you will find. *Choose foods that are easy to serve. *Get some sidewalk chalk and decorate the sidewalk that leads up to the shower. *Crepe paper and balloons are a cheap way to pop color. 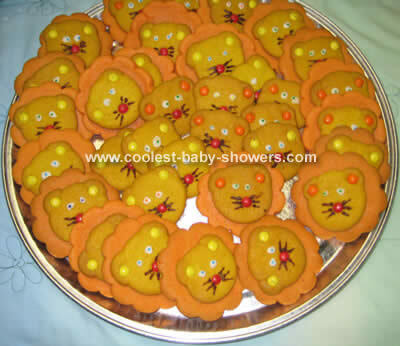 *Because the shower theme and the nursery theme were the same, the mom-to-be got lots of Safari-themed things. 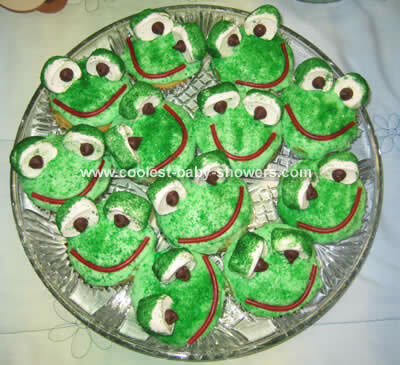 *Try to make whatever you can homemade, whether it’s the invitations, decorations, food or dessert. 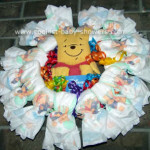 Homemade items are more special and meaningful than store bought. *Lastly, don’t forget to have fun!